I am a pile-it…. not a pilot that steers an airplane, a PILE-IT that you know, someone who piles things here and there. Piles of papers, projects, art supplies, magazines, and you name it litter our home. 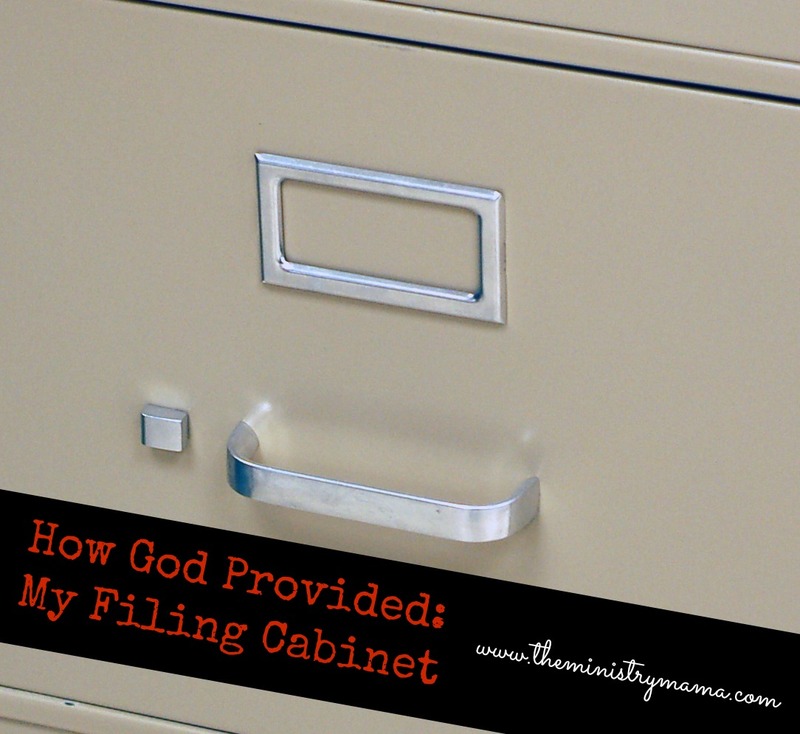 When God provided my filing cabinet it was a great pleasure to me that He fulfilled a desire of my heart. I don’t know if you’re a pile-it like I am, but it sure is hard for me to know what to do with papers and every type of paperwork. I feel guilty trashing a cute picture my children drew, or sermon notes that I took in church that spoke to my heart. In college we began a filing system to file our church related items that would help us in ministry some day. In our apartment fire, my file system that I had extensively been working on went up in the flames too. In all the years following our fire I have just been piling papers in file folders in banker’s boxes. I had wanted a file cabinet but never did ever buy one when my gravy train came in. It was one of those days where a lady in our church and her daughter volunteered to watch our girls so I could get some errands done. This duo of ladies have always gone out of their way to befriend the kids and care about their crazy allergy needs so they could have a snack when they were at their house. They have sought to be a blessing to us time and time again just because… not because they ever wanted anything in return. God’s provisions and miracles are always special. You never have to doubt His love when He rains down blessings from heaven through the generosity of others. It’s never any doubt that He provides when it is something that you have thought about but never really voiced to anyone else. God is so good like that, His Omniscience (all-knowing) is miraculous in itself. My piles are smaller now, my homeschool and ministry files are neatly tucked away in the metal drawers of my file cabinet. It is actually so full now that if I have both drawers open then it falls forward straight to the floor. It’s nothing fancy in its old gray color but boy do I love to think about how good God was to give it to me that afternoon. We have a propensity to expect all of God’s miracles to be climbing the hills of the impossible instead of being easy and simple. Every time I think I know how God will work things out for me because of how He has done it in the past, then He always changes it up and does something different. His ways are wonderfully mysterious, just to keep me mesmerized by His handiwork. You probably can think of an object God has provided for you in the past that was just like God handed it to you personally because it was so obvious and simple. I hope you remember it with fondness as you cherish the love God gives you even through the simple delights of meeting a silent or forgotten desire. Maybe you’d like to read some of my other stories about How God Provided: Washing Machines and Dryers, Clothes for Our Son, and Meat for Our Freezer.